For the opening of the highly anticipated Yogi Bear movie on Friday, December 17th, Leitersburg Cinemas has announced “Yogi Bear and Friends”, a partnership with locally owned Jellystone Park Camp-Resort at Hagerstown. At Leitersburg Cinemas on Friday, December 17th from 4:30 PM – 7:30 PM and on Saturday, December 18th from 11:00 AM – 2:30 PM characters Yogi Bear and Boo-boo will be in attendance to greet moviegoers. Prizes and giveaways will be announced during both days of the event, including (1) FREE Weekend Stay for up to 4 people at Jellystone Park Camp-Resort at Hagerstown and (1) FREE 5-Night Midweek Stay for up to 4 people at Jellystone Park Camp-Resort at Hagerstown. For official rules on prizes and giveaways, visit www.leitersburgcinemas.com. Check movie showtimes at www.leitersburgcinemas.com and come early before the movie to meet Yogi Bear and Boo-boo. The Yogi Bear movie will only be shown in 2D. “We’re excited to partner with our friends at Jellystone Park for this fun event. We’ve been in discussions for a couple months now and it’s great to see things come together. In typical Leitersburg Cinemas fashion, we’re going to throw a party! It will be a great time for everyone.”, said Jessica Rea, General Manager at Leitersburg Cinemas. “Yogi Bear and Boo-Boo love two things, #1 children, #2 a party. They are so pleased to have an opportunity to get together with the wonderful staff of Leitersburg Cinemas at the premier of their movie. I hope they behave themselves and stay out of the popcorn and candy.”, said owner Vicki Vitkun of Yogi bear’s Jellystone Camp Resort. Since the re-opening of the newly renovated Leitersburg Cinemas, over 32,000 people have returned to watch a movie in less than 6 months. Leitersburg Cinemas redefines affordable entertainment for residents of Hagerstown, Waynesboro, Greencastle and the surrounding area. In addition to first-run movies on 10 screens, the new Leitersburg Cinemas features “Dinner and a Movie”, retro nights, birthday packages, facility rental and special events for groups. For more information go to www.leitersburgcinemas.com or call 240-329-2062. Yogi Bear’s Jellystone Camp Resort in Williamsport, MD is 90 acres of family fun. The award winning resort is great for a family vacation or a weekend getaway for your family. With 42 cabins and 180 RV sites, two 400 ft. water slides and 2,000 sg ft. interactive pool, the only out door Lazer Tag course in the area, mini golf and more you are sure to have a great camping experience. For more information go to www.jellystonemaryland.com or call 301-223-7117. 1) Purchase and redeem a movie ticket for the 5:30 PM or 7:30 PM showtime of "Yogi Bear" on Friday, December 17, 2010 OR the 11:45 AM or 2:30 PM showtime on Saturday, December 18, 2010 at the Leitersburg Cinemas, LLC. You will be given an entry form, including your first name, last name, email address and phone number. For the 5:30 PM showtime on Friday, December 17, 2010 only one entry per family. For the 7:30 PM showtime on Friday, December 17, 2010 and for the 11:45 AM showtime and 2:30 PM showtime on Saturday, December 18, 2010 each movie ticket holder may complete an entry form. 2) Complete the entry form the day of the event before 10 minutes before the movie begins. 3) Turn-in the completed entry form into the designated box before the showtime you are attending. All contestants must be a legal citizen of one (1) of the fifty (50) United States of America, the District of Columbia, or another legal United States territory. A movie ticket to "Yogi Bear" is necessary for 5:30 PM or 7:30 PM showtime on Friday, December 17, 2010 OR for the 11:45 AM or 2:30 PM showtime on Saturday, December 18, 2010 in order to be entered into the giveaway. The giveaway will begin in the theater approximately 10 minutes before showtime. Entries for each showtime will be pulled randomly at the event in front of the live audience. Prizes will be handed out the night of the event. Chances of winning depend on the number of valid entries. Must be present to win. Must offer valid proof of identification. The first names only of the winning contestant may be posted on www.facebook.com/leitersburgcinemas in a congratulatory post. Employees of Leitersburg Cinemas LLC, High Rock Studios, or Jellystone Park Camp-Resort at Hagerstown, their immediate family, and any other persons who reside at their home or residence are not eligible for entry. Furthermore any and all applications from these individuals will be deemed void among entry. Leitersburg Cinemas LLC is not responsible for, nor will they replace, any prizes that are lost, stolen, damaged, or mutilated after the prize is claimed. Any copy, duplication, or reproduction on the entry form is strictly prohibited and will be deemed void upon entry. Contestants will be disqualified if they fail to comply with any and all of the giveaway's rules and regulations. By entering the giveaway, the winner is bound by all giveaway rules and also by any federal, state, or local laws. Rules and regulations are subject to change. Changes to rules and regulations will be posted promptly on the News and Events page of www.leitersburgcinemas.com under the post “Leitersburg Cinemas and Jellystone Park Camp-Resort at Hagerstown Partner for Yogi Bear Movie”. YOGI BEAR AND FRIENDS: For the opening of the movie “Yogi Bear,” we will have characters available in the lobby from 4:30 – 7:30 PM, brought to you by Jellystone Park Camp-Resort of Hagerstown. Come out and meet Yogi Bear and Boo-Boo! NEW MOVIE RELEASE: "Yogi Bear"
NEW MOVIE RELEASE: "The Fighter"
NEW MOVIE RELEASE: "How Do You Know"
YOGI BEAR AND FRIENDS: Same as above. Characters available in the lobby from 11:00 AM – 2:30 PM. We are pleased to announce the opening of (2) employment opportunities at Leitersburg Cinemas. Successful candidate will help coordinate group sales, facility rental, special events and advertising opportunities. Position will offer flexibility to work from home and as an independent sales representative, compensation is 100% commission based. The interest in our group sales, facility rental, special events and advertising has been consistent. Successful candidate will follow-up on requests and generate personal leads. To apply, send cover letter and resume to info@leitersburgcinemas.com. On Thursday, November 18th @ 10:00 PM. We are having a crazy party for the opening of "Harry Potter and the Deathly Hallows: Part 1"! Come out and have some fun. Here are all the details. Doors open at 10:00 pm. Movie Starts at 11:59 pm. $16.00 (Per Person) - Regular Admission, Unlimited Soda, Unlimited Popcorn, ButterBeer (non-alcoholic), 2 Slices of Pizza and Krumpe's Do-Nuts (while they last)! 1) Purchase and redeem a movie ticket for the midnight show of Harry Potter and the Deathly Hallows: Part 1 on Thursday, November 18th, 2010 at the Leitersburg Cinemas, LLC. With each movie ticket, you will given an entry form, including your first name, last name, email address and phone number. 2) Complete the entry form the day of the event. 3) Turn the completed entry form into the Leitersburg Cinemas LLC snack bar on the day of the event and before 11:30 PM on Thursday, November 18th. All contestants must be 13 years of age or older at the time of entry. Entrants under the age of 18 must get permission of a parent or legal guardian in order to be eligible. A movie ticket purchase for the midnight show of Harry Potter and the Deathly Hallows: Part 1 on Thursday, November 18th, 2010 is necessary in order to be entered into the giveaway. The giveaways will begin in the theater OR in the lobby approximately 20-30 minutes before showtime. Most likely, initial giveaways will begin at 11:30 promptly. Entries will be pulled randomly at the event in front of the live audience. Prizes will be handed out the night of the event. - (1) Two (1-day) passes to Universal Studios in Orlando to the Wizarding World of Harry Potter. Travel and lodging not included. Employees of Leitersburg Cinemas LLC, their immediate family, and any other persons who reside at their home or residence are not eligible for entry. Furthermore any and all applications from these individuals will be deemed void among entry. Employees of High Rock Studios, their immediate family, and any other persons who reside at their home or residence are not eligible for entry. Furthermore any and all applications from these individuals will be deemed void among entry. Rules and regulations are subject to change. Changes to rules and regulations will be posted promptly on the News and Events page of www.leitersburgcinemas.com under the post “Harry Potter Midnight Party”. September is official “Recruit fans to Leitersburg Cinemas” month! To us it is anyway!? Between now and Thursday September 30th, 2010, if 50 or more of your Facebook friends “Like” facebook.com/leitersburgcinemas, we will give you a FREE movie ticket for Friday, October 1st, Saturday October 2nd or Sunday October 3rd. Log-in to your Facebook account, go to facebook.com/leitersburgcinemas, scroll down and in left column (under our address) you will see how many “friends like this.” Once you recruit 50 or more friends, post on leitersburgcinemas’ wall. Once we verify, we will record your name so you can redeem your ticket at the box office. Remember, FREE ticket is only valid when you come see a movie on Friday, October 1st, Saturday October 2nd or Sunday October 3rd. By the way, the movie "Social Network" comes out on Friday! See web site for all movies and show times. Limit one free movie per person. Not redeemable for cash. Seating or specific show times are not guaranteed. Based on seating availability and while supplies last. We are excited to announce the 2010 Retro and Special Event Calendar for Leitersburg Cinemas. Check www.leitersburgcinemas.com for showtimes. Please note: there may be additions/edits to this calendar over time, but for the most part, this is comprehensive. We hope to see you soon at one of these great events! 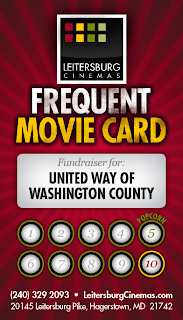 Friends and family will also love the Frequent Movie Card because they receive FREE popcorn on their 5th visit and a FREE movie when their card is filled, not to mention they had a big part in helping support your organization. The program is fun, effective and easy for everyone. Why is Leitersburg Cinemas doing this? As a locally owned, independent movie theater, it has always been our vision to impact the community and offer affordable entertainment for residents. This program offers the best of both worlds. We have also begun investing in the upgrade of the facilities at Leitersburg Cinemas to make it nicer. As of June of 2010, renovations to the theaters, bathrooms and lobby have been completed. Exterior and interior improvements will continue through 2010 and 2011. In addition to first-run movies, the new Leitersburg Cinemas features "Dinner and a Movie”, Retro Nights, two unique VIP theaters, birthday packages, corporate meeting rooms, and facility rental. - Upon registration, organizations will be given personalized Frequent Movie Cards (FMC) in lots of 500, including “XYZ Organization” on the front. See above. - Eventually, organizations will also be given a unique web address for temporary FMCs. Once they arrive at the box office, they will be given a permanent card. - Organizations pass out the customized cards or send their unique web address via email, Facebook, Twitter, etc. We only ask that organizations not distribute FMCs on the Leitersburg Cinemas property. 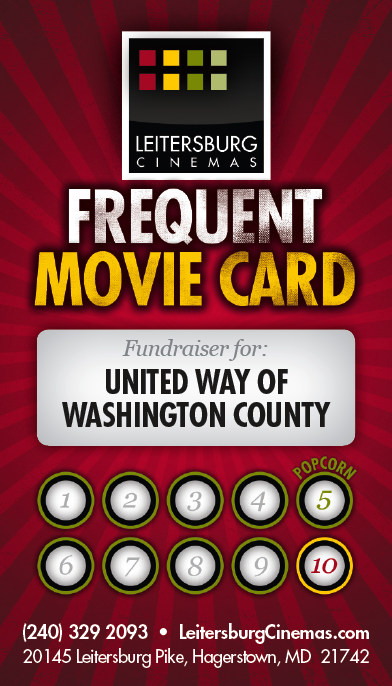 - When patrons to Leitersburg Cinemas show their FMC and purchase a movie ticket, $1 is donated to the organization. Not valid with any other offers, discounts or FREE movie tickets. - Organizations receive checks in the mail on or about the 10th of each month for the proceeding month. - There is no upfront cost to the organizations. $20 for each lot of 500 cards is deducted from the first or future month check(s) to cover the cost of printing and to encourage a realistic quantity for handout. XYZ Sports Team registers and requests 500 Frequent Movie Cards. The potential funds raised equals $5,000 (500 cards X 10 movies per card X $1). In the month of October, everyone who received a card from XYZ Sports Team comes to at least 1 movie. Raised funds for the organization is $480… $500 - $20 for (1) lot of cards. XYZ Sports Team receives a check for $480 in the mail on or about November 10th. That’s just the beginning… more friends and family come to the movies in November and December and each month XYZ Sports Team receives a check. It’s that easy! We're giving away an iPad this weekend! See how to enter and official contest rules an regulations below. 1) Purchase and redeem a movie ticket on Friday, September 2, 2010, Saturday, September 3, 2010, Sunday, September 4, 2010 or Monday, September 6, 2010 at the Leitersburg Cinemas LLC box office. See website for showtimes. Each movie purchased is eligible for a chance to win. The more movies you watch on the dates above, the more chances you have to win. 2) Complete the entry form the day of purchase. 3) Turn the completed entry form into the Leitersburg Cinemas LLC snack bar on the date of purchase. A movie ticket purchase between September 3, 2010 and September 6, 2010 is necessary in order to be entered into the iPad giveaway. The Leitersburg Cinemas LLC iPad giveaway entry process will begin at 11:30 AM on the day of September 3, 2010 and will run until 9:30 PM on the day of September 6, 2010. No entries will be accepted before or after the said time frame. Offer is not valid on previous purchases. The giveaway consists of one (1) grand prize. 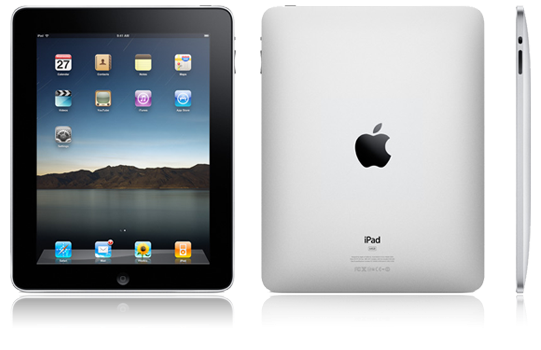 The grand prize consists of one (1) 16GB first generation Apple iPad. The grand prize is Wi-Fi enabled, but does not have 3G capabilities. Upon the closure of the entry period one (1) grand prize winner will be chosen at random by an employee or representative of Leitersburg Cinemas LLC. The giveaway winner will be contacted within forty-eight (48) hours of the drawing via either phone or e-mail. The first name only of the winning contestant will be posted on www.facebook.com/leitersburgcinemas in a congratulatory post. The winning contestant will have a one (1) week period from the date of contact to claim their prize. If the chosen winner fails to claim their prize within the allotted time frame a new winner will be chosen at random by an employee or representative of Leitersburg Cinemas LLC. Rules and regulations are subject to change. Changes to rules and regulations will be posted promptly on the News and Events page of www.leitersburgcinemas.com under the post “Win an iPad this Weekend – Sept. 3rd – Sept. 6th". Take a break from the summer heat and join the NEW Leitersburg Cinemas for some cool fun at the movies. G and PG movies start at 10:00 AM (box office opens at 9:30 AM) on select Tuesday’s and Wednesday’s throughout the Summer. Check our online showtimes for the current schedule. Movie titles, dates and times are subject to change. Tickets are offered on a first-come, first-served basis. Capacity is limited. or call us at (240) 329-2062. Hagerstown, MD – July 29, 2010 –The newly re-opened Leitersburg Cinemas in Hagerstown, Maryland recently added two key management positions to its staff. Jessica Rea will serve as General Manager and Ralph McIntrye as Director of Group Sales. Having worked at the formerly known Hagerstown Cinemas 10 for five years, Jessica Rea brings a wealth of knowledge having served in various staff positions until obtaining the title of Operational Manager in 2005. Her responsibilities will include the daily operations of the theater, scheduling, and the hiring and training of new staff. “I want to return Leitersburg Cinemas to its former glory and make it the #1 Family Movie Theater in the area! Not just a place to come a watch a movie, but a place to enjoy”, said Jessica Rea. Jessica graduated from Smithsburg High School and is working on an Associate’s Degree from Hagerstown Community College. After working in retail management in Virginia Beach, VA, she recently moved back to the Hagerstown area where she resides. Leitersburg Cinemas also recently announced Ralph McIntyre, Director of Group Sales, to oversee special events, groups of 10+, birthday parties, fundraiser packages, corporate meetings and the weekly coordination of the popular Dinner and a Movie. “We’ve already worked with a number of groups in the area, and we had our first Birthday at the Movies last weekend. And Dinner and a Movie is just awesome”, said Ralph McIntyre. Ralph graduated from Waynesboro High School and is pursuing his Bachelors in Marketing from Penn State as well as his associates in Computer Networking Security from Hagerstown Community College. Having worked at Hagerstown Cinemas 10 for many years and also as the Group Sales Assistant for the Frederick Keys Baseball Team, specializing in Birthday Parties and Team Events, Ralph will bring much experience to the theater. “We joke around that we’re ‘getting the team back together again’, because most of our management and supervisors have worked at Leitersburg Cinemas in the past and simply love the facility. They all believe in the vision of returning Leitersburg Cinemas to greatness. We still have a lot of work to do, but we’ll continue to work hard at making it happen”, Rich Daughtridge, Co-owner. The new Leitersburg Cinemas on Leitersburg Pike is now open to the public—and redefines affordable entertainment for residents of Hagerstown, Washington County, and the surrounding area. In addition to first-run movies on 10 screens, the new Leitersburg Cinemas features “Dinner and a Movie,” birthday packages, and corporate meeting rooms. For more information go to www.leitersburgcinemas.com or call 240-329-2062. WASHINGTON COUNTY — After eight months dark, Leitersburg Cinemas north of Hagerstown has reopened. The first day of movies was June 11, said Rich Daughtridge, a partner in Leitersburg Cinemas LLC, the company running the multiplex. This weekend, the cinema is holding a grand opening with children’s activities to tie into the release of the animated movie “Toy Story 3.” Daughtridge said there will be face painting, balloons, an inflatable bounce and people dressed in movie character costumes from 4:30 to 8:30 p.m. Friday and Saturday. Other cinema operators have come and gone. The cinema briefly shut down in 2002, 2006 and 2007, in between operators. The last operator, Diamond Cinemas, shut down in October 2009. The business was known at the time as Hagerstown Cinema 10. The new focus will be family entertainment. Daughtridge said the cinema will show “mostly” G, PG and PG-13 movies. ShoWest Convention for the Movie Theaters - Viva Las Vegas! Last week, we flew to Las Vegas for ShoWest - the national convention of the movie theater industry. Being new in the industry, we didn't know much about it, nor did we think much of it. In the weeks leading up to the show, however, we heard from a few counterparts and vendors, "See you in Vegas in March?" or "Hey, are you going to the Show?!" And now we know - the movie theater industry is not one to be taken lightly. We left Hagerstown in the early hours of Tuesday and hopped on a westbound plane. After two flights and a 3-hour layover in Los Angeles, we descended on Las Vegas. The convention was held at Paris and Bally's; we quickly dropped our bags at our hotel - the beautiful Belaggio - and made our way across the street. The venue was enormous and filled with thousands of movie buffs, theater owners, concession companies, ticketing software companies and industry organizations. We quickly registered, got our credentials for the events (those cool, VIP-looking badges you wear around your neck) and started exploring. By the end of Tuesday, we had a handful of brochures and informational packets and a pocketful of business cards. Amongst our hunting, we even stumbled upon some great marketing idea and a couple tasty popcorn samples. We headed back to our hotel to digest the information from the day and prepare for Wednesday; we still had quite a to-do list to tackle in one day. The Belaggio was a perfect place to recharge; dinner in one of the hotel's many restaurants, Sensi, was fabulous and the creative, colorful decor of the hotel was inspiring. We used all of Wednesday talking theater business with industry leaders, from companies like Fandango and RC Theaters. I think we had that "fish out of water" feeling initially; here we are amongst the big dogs in the industry, little Leitersburg Cinemas! Being that we're a new company and a new brand, companies were excited to see that we were starting fresh, from scratch. It seems the latest trend in the movie theater industry is focused on enhancing the whole experience of a night at the movies. Movie theaters around the country are focusing on the concept of dinner and a movie and making "going to the movies" more glam than a ticket stub, popcorn and a soda. Theaters are integrating 3D technology, full restaurants and bars into the theater facilities. We caught a red eye flight back to Maryland on Wednesday night. Nothing like jet-setting to Vegas for 35 hours of movie theater one-stop shopping...and a few games of blackjack. More Pictures of the Renovations - Thank You Volunteers! Thank you to everyone that's donated precious weekend time to help fix up the theater! What Movies Will You See This Summer? What movie are you most looking forward to this summer? A sucker for a good series, I'm slightly embarrassed to say that I'm most looking for the third installment in the Twilight saga. Yes, I said it. I can't wait to see Bella and Edward on the big screen in this summer's Eclipse (although, I'm definitely Team Jacob). Beyond Hollywood put together a cool list of the 10 Most Anticipated Summer Movies of 2010.